Apple’s Expensive Data Centre a Hoax? 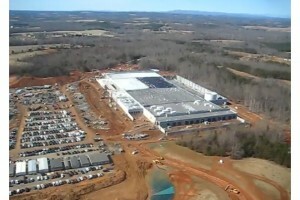 Techeye was reporting that the new datacenter that Apple was working on is nothing but a hoax. It has found that Apple has spent a fortune on creating a huge expensive data centre which is actually just an empty building. For a while now Apple has been touting the new $1 billion Apple data center in Carolina as its bid to enter cloud computing and a key component in its iCloud strategy. Stories, which have been leaked to the tame Apple press, emphase how much Apple paid for the land and the amount of electricity it will go through. However according to Robert X. Cringely’s bog, the place has no equipment in it and is mostly empty. It is difficult to find that out. Apple has built a tall earthen wall around the entire site and planted trees atop that. But if you steal your way from the Baptist cemetery next door you can see the top of a huge white building and a couple of big tanks. Only one truck visited the site. What is odd is that the new data centre is supposed to be the centre of iCloud and iTunes activity, updating all those Macs, iPhones, and iPads. More to the point, Apple has been telling the world+dog that its data centre has 500 times more space than IBM’s equivalent. Cringely has done some adding up and worked out that even if Apple’s iCloud really was talking off, there is no way it needs that sort of space to keep operating. Apparently even Google, which keeps updating the whole Internet does not need that much. Apple could get by with a tenth of the space. If it is trying to future proof the centre then it has wasted its money because every one knows that computers will get smaller. “I think it’s a joke. The building is a near-empty facility built primarily to intimidate Apple competitors. And so far it seems to be working,” he wrote. Previous iPhone 5 to be launched on September 7!